Migration watch; 20.05 – 21.30hrs. On the move south were 17 Oystercatcher, 1 Black-tailed Godwit and 1 Whimbrel. 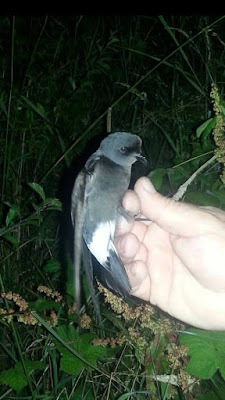 A Storm Petrel ringing evening at Crook Ness took place during the evening however it wasn’t until the early hours of the 30th until the action started. The first bird to be trapped was a Leach’s Petrel (the first since autumn 2013!) at 01.05hrs with two Storm Petrels following at 01.23hrs and 01.40hrs. 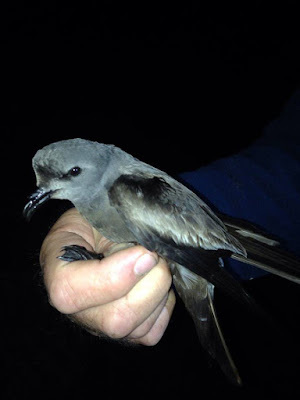 A third Storm Petrel was noted flying round the nets. Of interest, during the evening 5 White-beaked Dolphin were seen several times between Cornelian Bay and South Bay, the first record of this cetacean in Scarborough for many years!